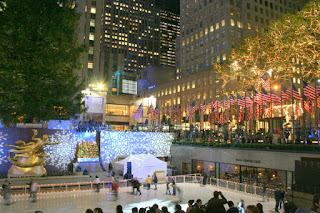 I went to New York City on a business and my wife Catherine took vacation from her job to join me and we left on a Saturday so we could enjoy the city. 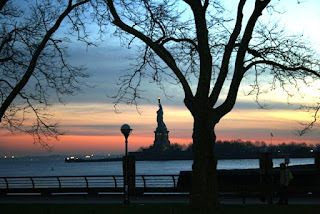 Catherine and I waited for the ferry at Ellis Island to go back to Battery Park and there was a beautiful sunset with the Statue of Liberty in the background. 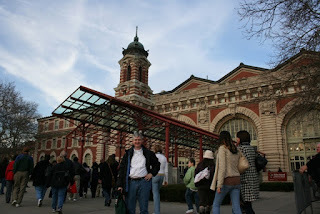 After we left the Statue of Liberty we took a ferry to Ellis Island. On the ferry from Ellis island we had great nighttime views of the New York City skyline. 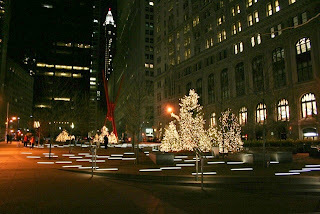 We walked from Battery Park all the way back to our hotel on 28th Street. 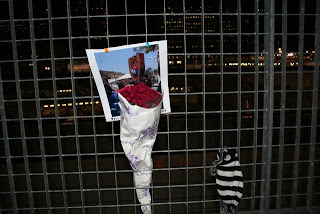 Along the way we saw Ground Zero at the World Trade Center site. 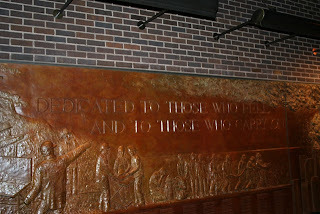 A listing of active Fire Department members lost on 9-11 is displayed on the sculpture by rank (in alphabetical order) and includes each member’s company number. 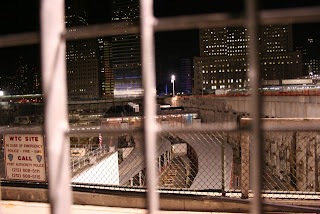 A timeline of major milestone events pertaining to attacks and the Department’s rescue and recovery effort is also incorporated into the base of the memorial. 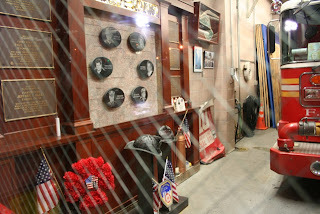 Memorial inside the New York Fire Department Fire House 10 is located across the street from the World Trade Center site. They were the first to respond. 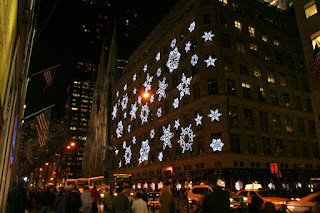 As we walked we also saw lots of Christmas lights. 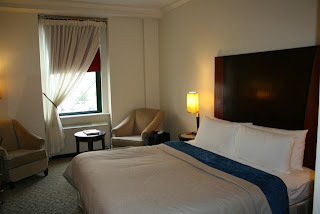 While I was in New York I stayed at the Park South Hotel. 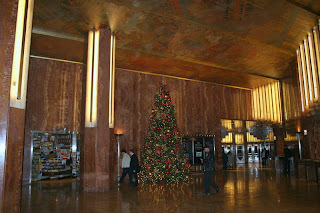 For New York City it was a large room, centrally located in Manhattan, and very clean. 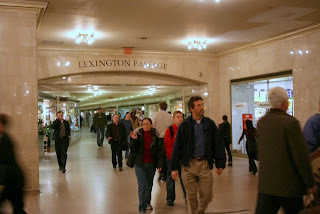 Catherine going to Grand Central Station from the subway system. I told Catherine that I would take her picture and she is waving and trying to look at me, but is very distracted by the window shopping. 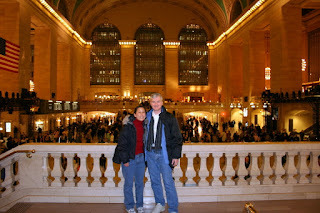 Catherine and I inside Grand Central Station. 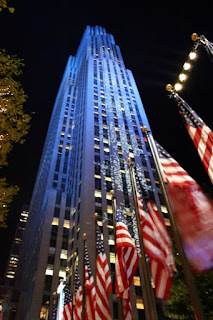 One night we took the subway to Grand central Station and then walked to the Chrysler Building. 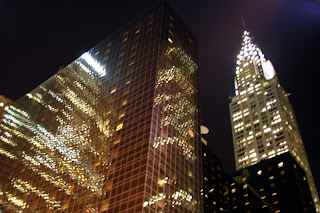 View of the the Chrysler building and lights reflected in a building next door. 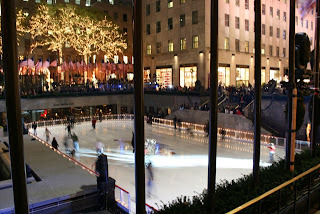 We then walked up to Rockefeller Center and watched the ice skating and looked at the Christmas lights.